Another week has come and gone and thank goodness it’s decided to cool down around here. I’m itching to bust out the boots, but I’m holding back. This weekend I’m planning on looking at a few more houses and spending QT with the babes. 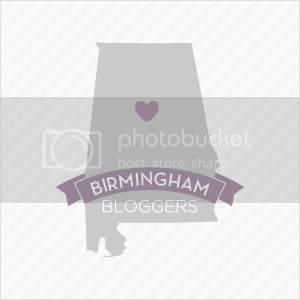 Here’s some links that caught my eye this week. This colorful and super chic DC home tour. I’m a fan of simple closets and this guide was really helpful for me. Putting this Kate Spade cosmetic case on my wish list. I’ve been nose deep in this book. Have you read it yet? So many booties, so little time. As you already know, I’m a bookcase fanatic. There really is an art to styling a bookcase. You can’t just throw a bunch of things up there and hope for the best. It requires thought, time and organizational skills. 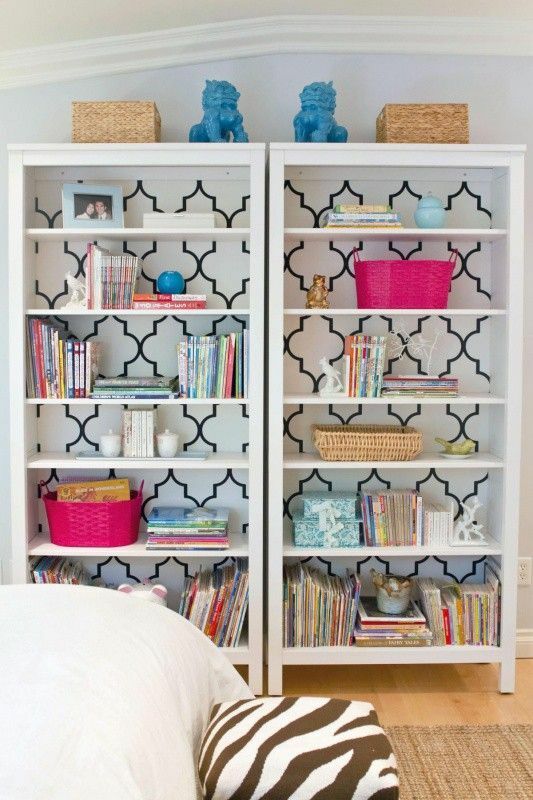 But you can learn how to style a great bookcase in no time! Before you begin styling, double check and make sure you have these five things. Colorful books. 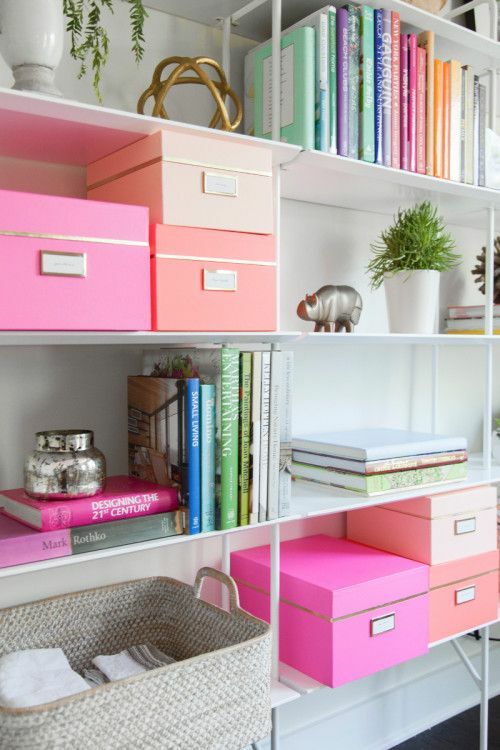 If you want your bookcase to be a focal point and be full of color, you must have pretty colorful books. Don’t get me wrong, a neutral bookcase can be just as elegant. But why not have a little fun and add some pops of color. Greenery. You can’t go wrong with adding a little greenery. This can be done with faux flowers and succulents from discount home stores like Home Goods and Tuesday Morning. 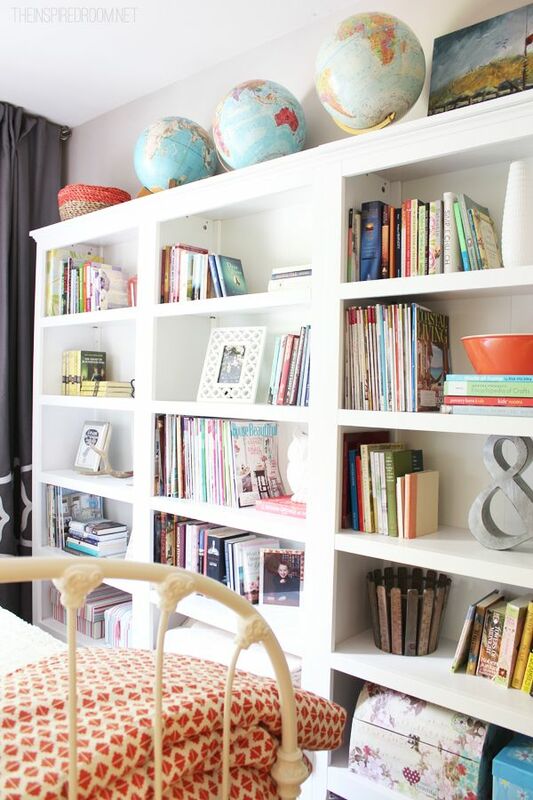 Freshening up your bookcase can do wonders! Decorative objects. I love little sit-arounds like this bronze rhino. Find a few objects at your discount home store that serve a little meaning to you. Candles, jars, animals, glass vases, and geometric shapes had interest and dimension to your bookcase. Without them, your bookcase can look a little flat. Storage boxes. 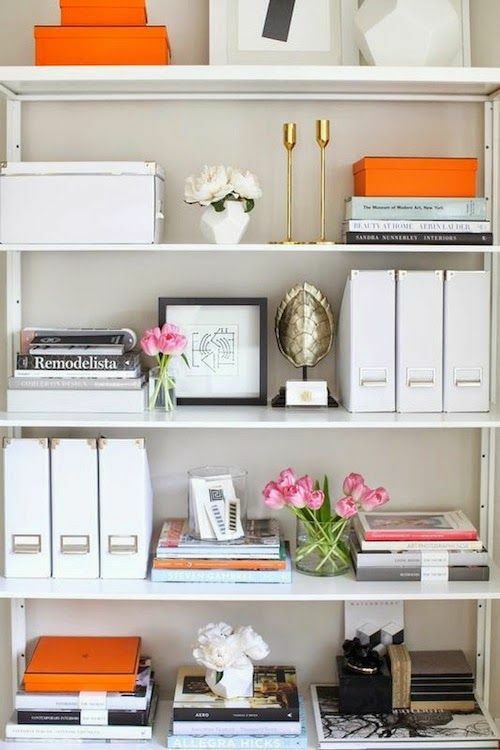 These are great to have to store old photos or hide TV remotes while also adding color to your bookcase. They don’t have to be hot pink, but find a color that works well with your décor. You’ll be surprised how much you can store in these things. Storage boxes come pretty cheap; I’ve found them at Target, Walmart, Office Depot, and TJ Maxx. Baskets. Baskets are another way of storing items you wouldn’t necessarily want poking out, but that you don’t want completely hidden either. They give your bookcase texture and warmth among all the flat and shiny objects. Depending on your room, baskets can hold a lot of things such as towels, office supplies, sandals, or cooking utensils. They can be flat or deep, but a little bit goes a long way. 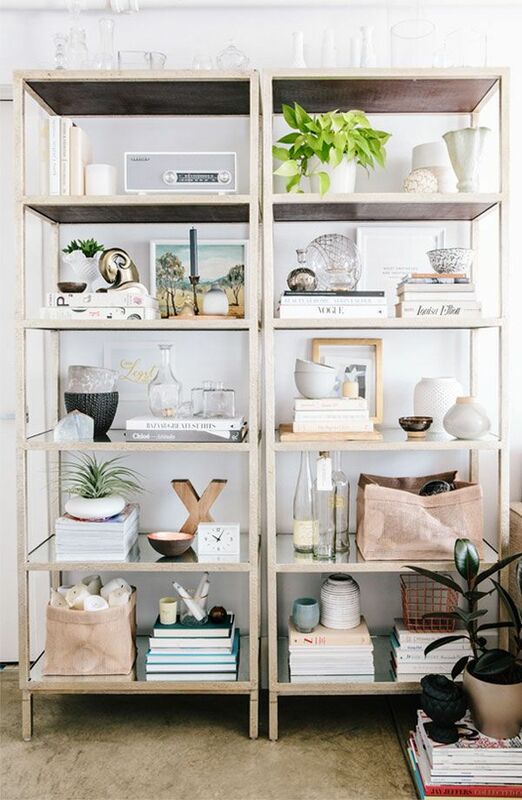 Stay tuned for more bookcase styling tips! Happy styling! It’s still well into the nineties most days here in the ‘ham. For a redhead like me, I need to deflect the sun away from me, so this little white number came in handy. I snatched this top up as soon as I saw it. It’s even more prettier in person. The laser cut and embroidered detail is flawless, and I love that it can be dressed up or down. For a Sunday morning, I paired it with cropped jeans and wedges, but for a night out I’d toss the jeans and throw on some cute patterned shorts. This top is simply my new favorite. It’s a perfect transition piece into fall. Throw on a blazer or cardigan, and you’re good to go! 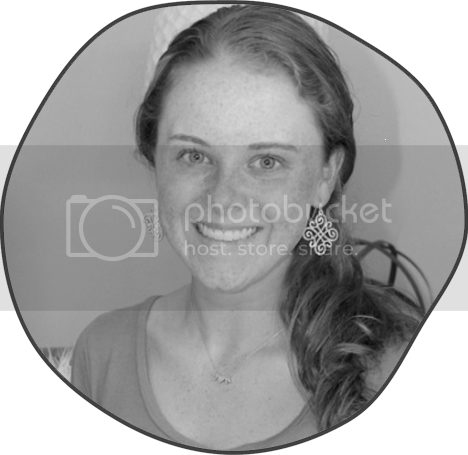 PS: These earrings were less than $5 at Walmart! They actually have super cute (and super cheap) jewelry! Cheers to the weekend! I don’t have many plans, but I’m looking forward to getting a mani with my bestie tomorrow am after a quick workout sesh. I’m so excited about the Planet Fitness that just opened across the street from my house. It’s so close, so there’s no excuse why I shouldn’t go at least three times a week. I always look forward to Sundays because I’m just so in love with our church! I’m so glad we found a new home. Here’s some of my favorite links from this week. Have a happy one! Ripped jeans = bae, and these are on my wish list! I’ve been living off of tomato basil soup from Melt Bham. This copycat recipe will come in handy this fall. Just snagged this decorating book from BFB. Stay tuned for a review! A fun polka dot pillow to brighten up any décor. If you know me, you know I adore styling bookcases. I dream of the day I have a wall-to-wall bookcase that I can fill with pretty books and boxes or a secret nook behind a library door. I’m such a nerd. But seriously, I can literally sit on Pinterest and browse bookshelves all day. 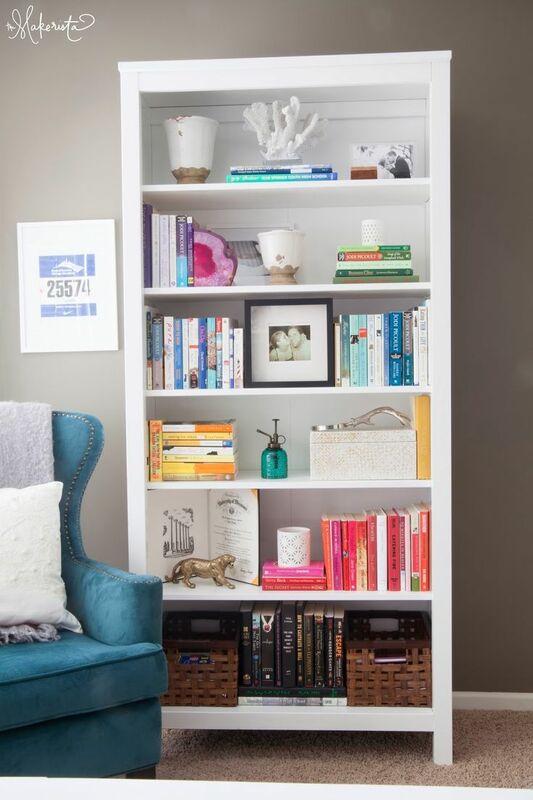 There’s just something about a perfectly styled bookcase that make a room pop. Bookcases serve as functional pieces, but that doesn’t mean you can spice them up with color books and figurines. Here are some of the best shelfies from Pinterest!